ASENSE of excitement filled the air as more than 100 university students gathered for the inaugural Nescafe Youth Entrepreneurship Programme (NYEP) Awards recently. The six-member team from International Islamic University Malaysia (IIUM) was named the grand prize winner, taking home RM25,000. The IIUM team also won the “Kahuna Mestros” category prize, presented in conjunction with International Coffee Month in October. The team was awarded another RM5,000 for selling more than 4,000 cups of coffee at the Nescafe Pop-Up Store in their campus. Team leader Tengku Mohd Hazwanhisyam Tengku Zulkarnain, 23, said his team’s efforts and hard work had paid off. “We did our best but winning two awards was beyond expectation,” said the third-year law student. He added that another winning factor was his team members, which were handpicked carefully. Tengku Mohd Hazwanhisyam said the prize would come in handy if they decided to set up a business venture. Apart from receiving a start-up investment in kind, the participants were equipped with basic entrepreneurial skills ― from learning to prepare and craft drinks, to managing a business and developing promotional plans. NYEP focuses on an area close to Nescafe’s heart ― empowering the youth through training and entrepreneurial skills. Since 2016,the programme had engaged close to 5,000 young entrepreneurs, and more than 1.2 million students had been involved in its pop-up stores. Universiti Pendidikan Sultan Idris (UPSI) was first runner-up, winning RM10,000, while Universiti Teknologi Malaysia (UTM) was second runner-up, winning RM5,000. Various category awards were also given to top performers, such as “Biz Masters” (highest sale), “SuperBrewers” (best hub operational criteria) and “Super BariStar” (best signature drink). Participating universities, besides IIUM, UPSI and UTM, were Universiti Sains Malaysia, Sunway University, Universiti Kebangsaan Malaysia, Universiti Putra Malaysia, Universiti Malaysia Pahang, Universiti Malaysia Terengganu and Universiti Utara Malaysia. Nescafe business executive officer Othman Chraibi said youth employment was a “hot button” issue and his company, Nestle Malaysia, wanted to be part of the solution. “Our programme helps university students learn valuable entrepreneurial skills by running Nescafe Pop-Up Stores. 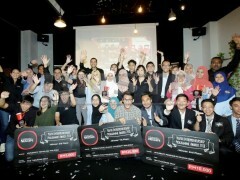 “As they say, it all starts with a Nescafe,” he said before presenting prizes to the winners. Othman said the students had done the programme proud and the profits would be channelled back to their universities. A dialogue was also held, which saw celebrity chef Anis Nabilah Umaruddin and DOJO KL co-founder Dewan Ng joining Othman and Nestle Malaysia talent acquisition manager Shariza Mohd Razi as panellists. Anis Nabilah said her childhood fascination with culinary arts had led her to enrol in the Food Institute of Malaysia, graduating with a diploma in 2007. She had won numerous awards and accolades, with the most memorable being the Culinaire 2007 competition. “When I started in 2008, nobody took me seriously. Eventually, thanks to support from food TV networks, I was able to fulfil my dream,” said the bubbly lass, who made her debut in Icip-icip and Mencari Resipi Temurun. Ng, as a chief community builder, works to build the local entrepreneurial community, transform the quality of everyday work life and help businesses to grow. “Taking a people-first approach, I believe that inspiration, happiness and connections have enabled me to create and innovate, which leads to increased productivity,” said Ng, as he spoke about DOJO, a dynamic co-working space in Kuala Lumpur. Shariza, on the other hand, focuses on recruitment and employer branding for Nestle. She began her career 10 years ago as a management trainee. “My passion is working with young talents and coaching them to develop their leadership skills, which is a key ability for all young aspiring leaders,” Shariza said.